Ph.D. in Electronics and Telecommunication is a 3- 6 year Doctorate program in Electronics and Telecommunication engineering. The eligibility criteria require the applicants to qualify master’s degree in any discipline or earn an M.Phil with an aggregate of 55% and above from a recognized university listed under UGC/AIU. Ph.D. in Electronics and Telecommunication course is a complete thesis or research-oriented program. Candidates are supposed to clear the common entrance examination held by the university to seek admission for the course. However, some colleges may conduct their own entrance examinations. After clearing the entrance, candidates are required to go through Group Discussion and Personal Interview. They are also required to submit their research proposal before the interview process takes place. At the end of the course during the final semester, students will have to submit a thesis under the guidance of experts. Candidates who possess good skills of communication, leadership and problem-solving abilities are deemed suitable for this course. In addition, those who showcase competencies to understand and use mathematics, have good business and analytical competency can perform well in this course. This program trains students to gain good insight in conducting research on the subject. It is especially beneficial for those, who wish to take up their career as a full-time professor in universities and colleges. After completion of the course, the doctorates of electronics and communications have the opportunity to start their career in the field of research and other communication areas like Agriculture, railways, forensic, wireless communication industry, etc. where the study of the subject is applied. 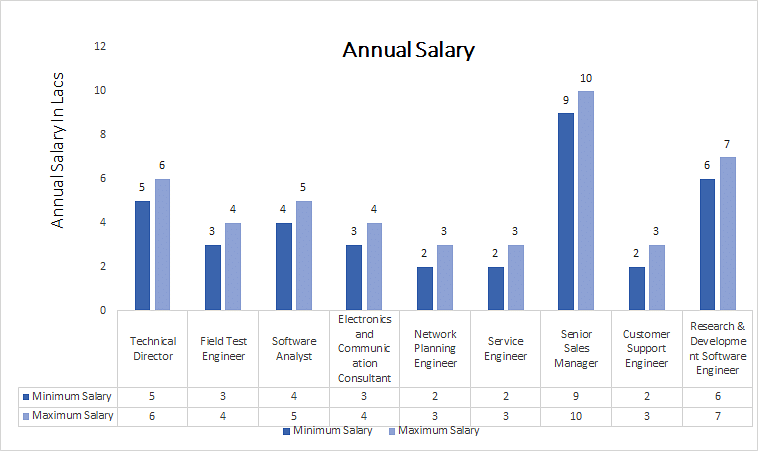 The average salary package of fresher ranges between 2 to 7 Lacs, which can gradually increase with experience. Eligibility Bachelor’s degree in B.Tech or B.E in chemical, computer, telecommunication, bioinformatics, etc with an aggregate of 55%c and above from a recognized university. Job Positions Technical Director, Service Engineer, Software Analyst, Network Planning Engineer, Customer Support Engineer, Field Test Engineer. Ph.D. in Electronics and Telecommunication: What is it About? Ph.D. in Electronics and Telecommunication is an integrated study of methodologies involved in generating, designing and resolving troubles in engineering electronic equipment and systems. The program gives a deeper insight to the students into its application in various sectors along with aiding them with the necessary skills required in formulating sophisticated solutions. The field of a Ph.D. in Electronics and Telecommunication engineering is mostly a thesis related program. Students opting for the course are required to possess the ability to analyze problems, innovating new structure and applying mathematical validation to the research. Having the zeal of leadership skills, application of evaluative methods alongside having good decision-making abilities makes the individual apt for the course. Ph.D. in Electronics and Telecommunication syllabus is a balanced blend of theory and practice. It also involves working on projects and case studies as applied to the sector. The students through classroom study of the theory are given a detailed knowledge of understanding the fundamentals of the subject which involves the study of electromagnetics, communication. Application of biomedical signal processing, microprocessors and many more, builds a good stronghold for candidates to apply them on the work front. Candidates for the thesis work are given a realistic approach to the sector, building on the dynamism of devising and innovating new approaches to meet the technological needs. Thus, the doctorates have a wider scope in starting their career in a varied arena such as Health & medicine sectors, Communication industry, Marketing and IT. The aim of the program is to generate skills including assembling, repairing and maintenance creating a strong foothold for candidates in the career they pursue. Those who have successfully completed their master’s degree in any discipline or has qualified M.Phil with an aggregate of 55% marks and above from a recognized university listed under UGC/AIU are deemed eligible for admission. Candidates are required to clear the various common entrance examinations held by universities and institutions like GATE, NET, etc. They are required to clear the GD/PI process. Candidates who seek admission for the program of Ph.D. in Electronics and Telecommunication are required to hold a Master’s Degree in any relevant stream or an M.Phil with a minimum aggregate of 55% marks and above listed under a recognized university. They are also supposed to qualify for various entrance examination held by institutions and universities in order to further the admission process. Candidates who seek admission to IIT, clearing JEE Entrance Test is a prerequisite. Admission to the course is done solely on the basis of merit list. Candidates who are shortlisted are supposed to go through GD/PI, which is held to check the level of knowledge and competence in the subject. The weightage of marks for GD/PI and entrance examination will be as per the norms set by institutions. Cumulative marks obtained in the entrance test, GD/PI and score obtained degree level lays the ground for admission. Applicants can apply for the program both through online and offline mode with all the important information, dates and details of entrance examination available on the official college site. The application status of students would be displayed on the site, with the shortlisted applicants being notified through email or on site. The curriculum of the Ph.D. in Electronics and Telecommunication course is a balance between theory and projects, the weightage of which would be as per the norms prescribed by colleges. The syllabus comprises of a comprehensive study of the subject, detailing the application of electronic study, use of telecommunication in various fields of business, covered in the span of 3 years. ** The pattern of the syllabus is subject to differ as per the norms formulated by different colleges and institutions. Ph.D. in Electronics and Telecommunication qualifies the students in getting an in-depth knowledge of the subject, thereby strengthening their core competencies in areas of leadership, innovation, and analytics. Doctorates of the program can benefit in sectors of Health, Telecommunication, IT and Research. This course is beneficial for those who wish to pursue their career in the field of academics. They have the scope to become technical director, Software Analyst, Electronics and communication consultant, network planning engineer and other such.